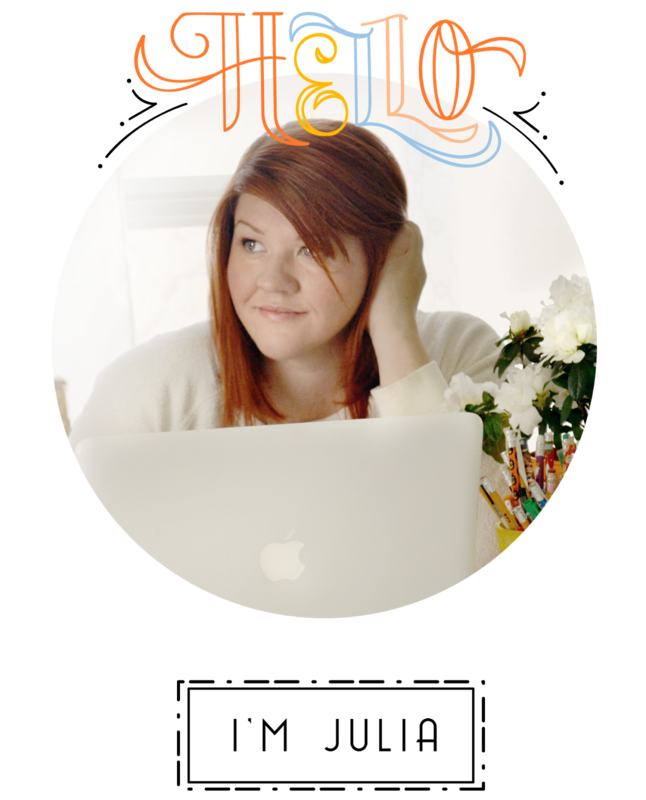 Hi Everyone, very excited to be guest blogging today on Everyday Mom Ideas! I've read through all the other wonderful guest post projects and hope mine will be just as fun and useful. As an avid knitter and crocheter, I have recently started a knit and crochet etsy shop called Chocololic Knits, as well as a blog about the projects I'm working on, knitting tutorials, and other fun craftsy things. If you enjoy this DIY project, please check them out! 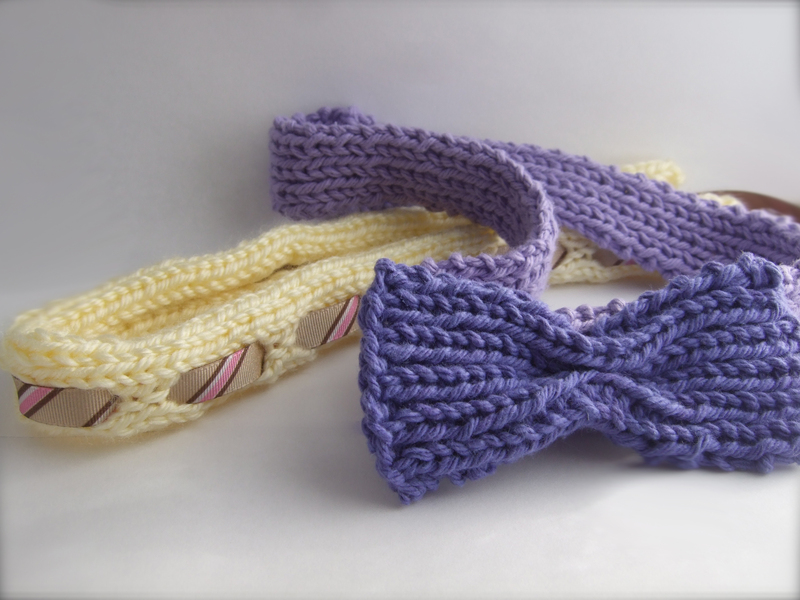 I thought a fun small project would be a tutorial about how to knit your own headbands, either for yourself or for your kids. I made 2 examples with steps to follow, but you can also make tons of different variations on them so go wild and make something unexpected and one-of-a-kind! This project uses simple knitting stitches, but if you have never knit before check out the tutorials "How to Cast on stitches," "How To Knit," and "How to Purl" on my blog for instructions to get started. 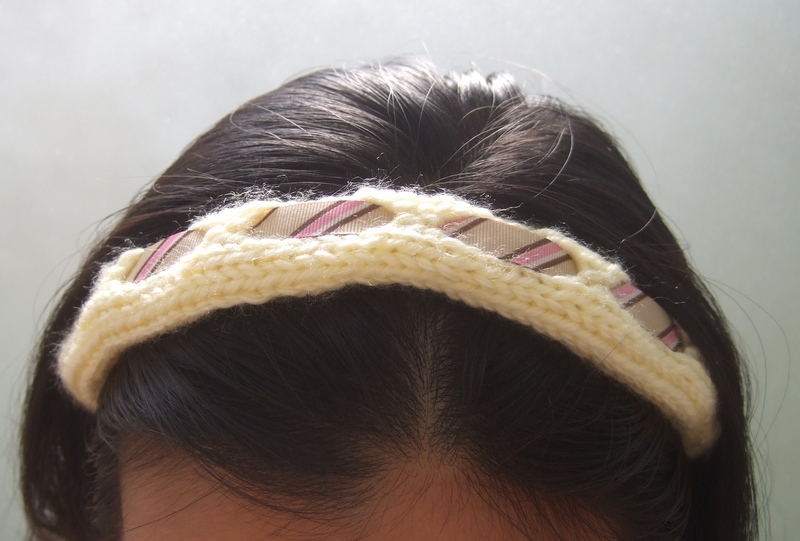 This headband is worked in knit-1, purl-1 ribbing, which is a pattern where the purl stitches seem to get "sucked in" next to the knit stitches so that both sides appear to be knit stitches only. Knit stitches are the pretty stitches that look like letter v's, while the purl stitches have horizontal bars and are usually not preferred for the front sides of knit projects. 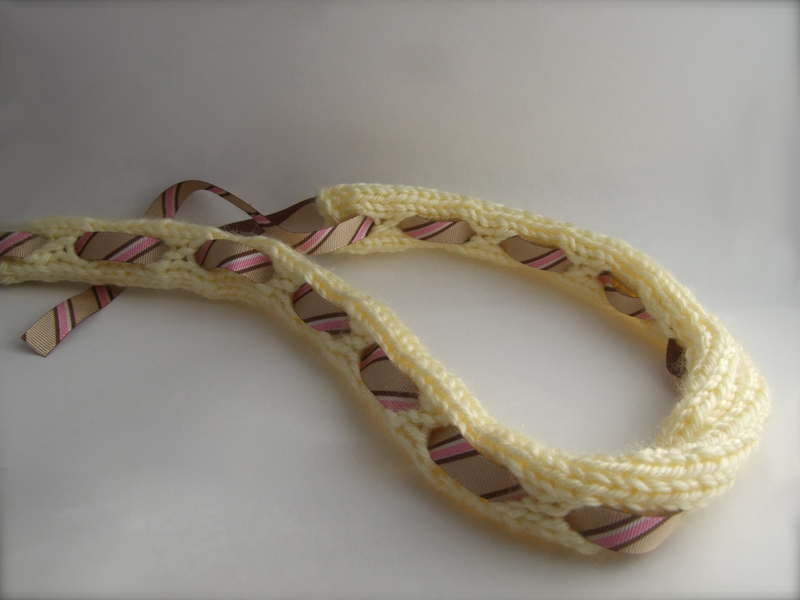 Materials: cotton yarn (like Lily or Sugar n' Cream brand), size 6 knitting needles. 1. Cast on 8 stitches. 2. Work each row in a knit 1, purl 1 pattern. Since there are an even number of stitches, each row (front and back) are worked the same, and there is no need to keep track of which side is front or back. 3. Work until band is long enough to fit around your, or your child's, head. The material should be a little stretchy so slightly smaller is better than too large a fit. 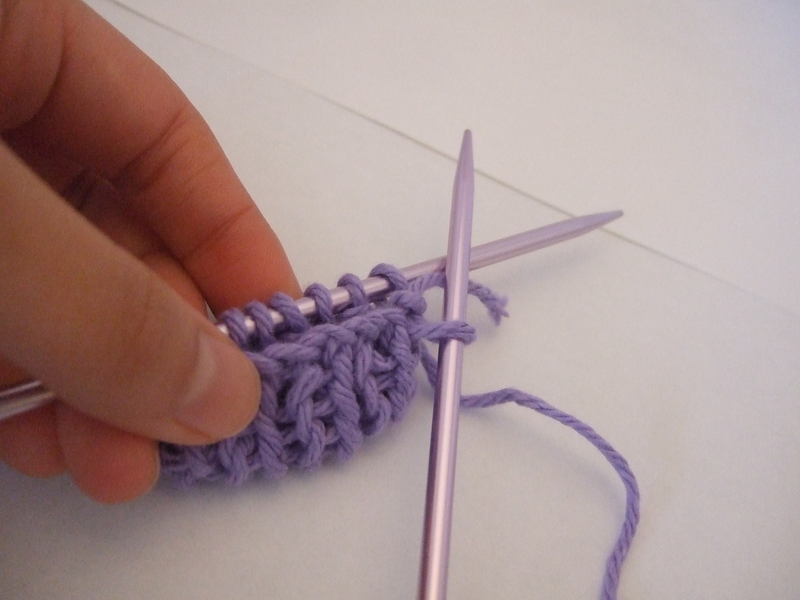 Do not bind off immediately, see step 4 and the photos below for how to bind off while joining the ends of the headband. 4.a. Fold up the cast-on edge and hold in front of the last row you were knitting (these are called "live" stitches as they are still on the left needle). You will be knitting through both ends of the headband to join them, and binding off the stitches at the same time (which will make a nice clean seam without any extra sewing, yay!). 4.b. Put the free knitting needle through the right-most stitch of the cast-on edge, and then through the first "live" stitch. 4.c. 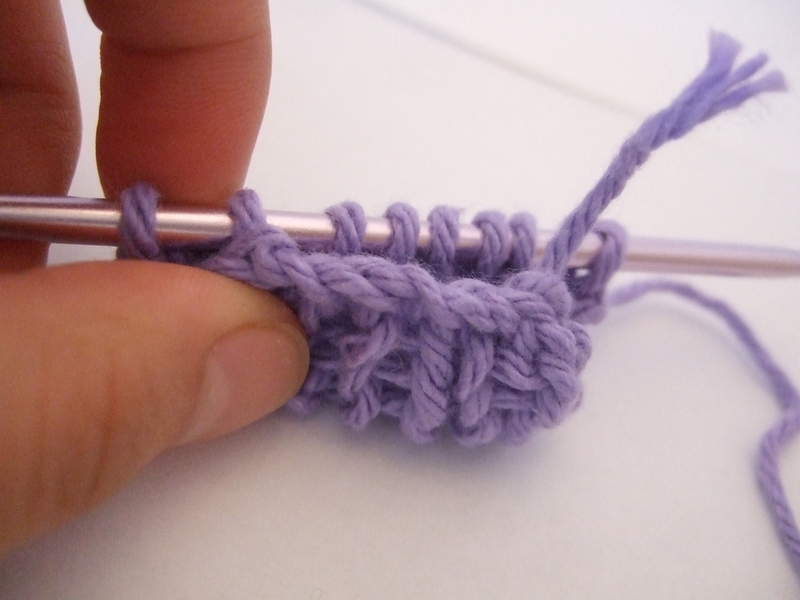 Knit the stitches together as one stitch. 4.d. Repeat and knit the next cast-on edge stitch with the next live stitch together. 4.e. 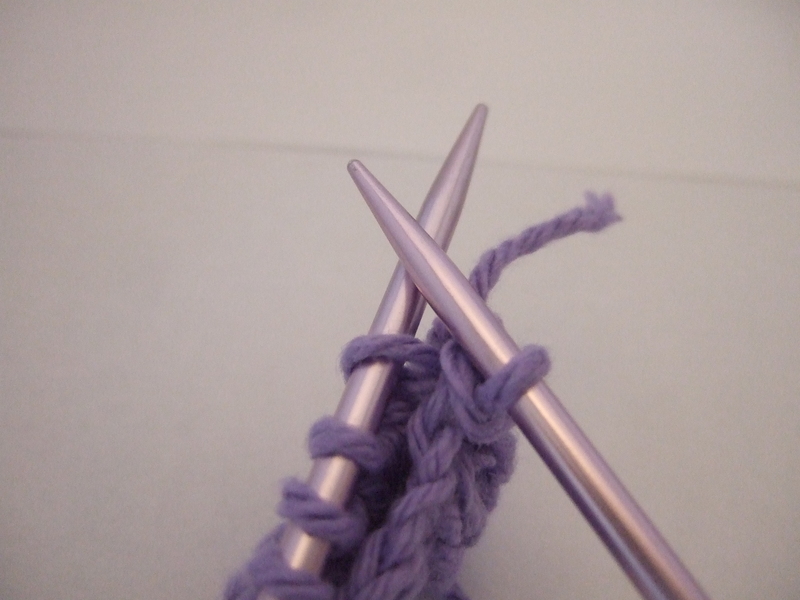 You have 2 stitches knitted on the right needle, now you will "bind off" one of them. Slip the first knitted stitch over the 2nd knitted stitch (to the left) and off the needle- now you only have 1 knitted stitch on your right needle. 5. To make the bow, cast on 12 stitches. 6. Work in knit 1, purl1 rib pattern until the piece is 4.5", or whichever size you would like your bow to be. 7. Bind off as done for headband, but without joining the ends of the bow: Knit 2 stitches, slip 1st stitch over 2nd stitch and off needle, knit next stitch, slip older stitch over and off needle, etc. 8. Sew bow to headband on side away from the headband seam. Sew a few stitches pinching the bow in the center, then sew a few stitches through both headband and bow to attach. 9. Weave in all yarn ends. Ta dah! 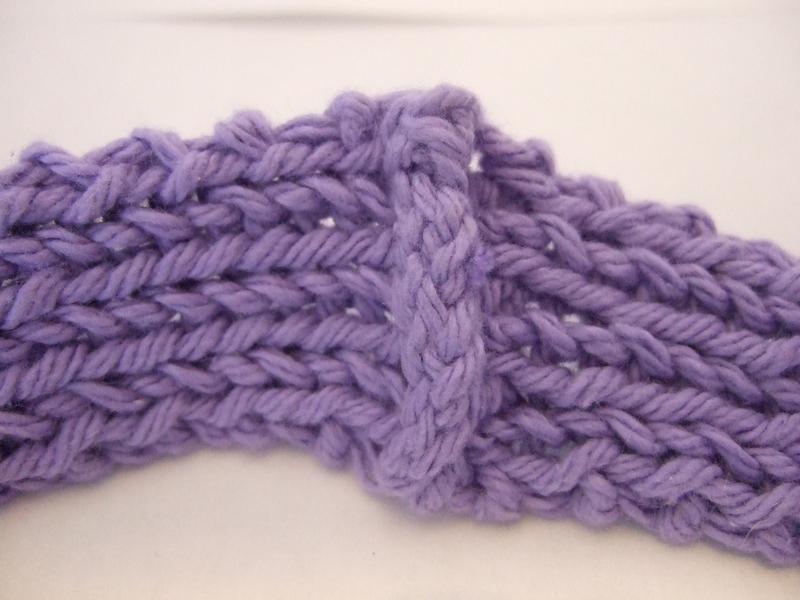 This headband is worked in all knit stitches on the front side, and purl stitches on the wrong side. 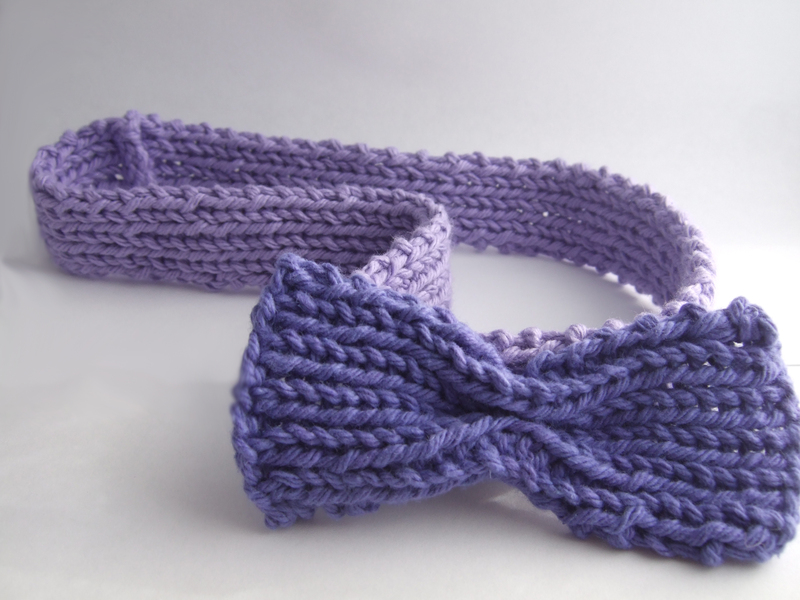 Yarn-overs and knit-2-togethers create "holes" in the headband to thread a ribbon through. 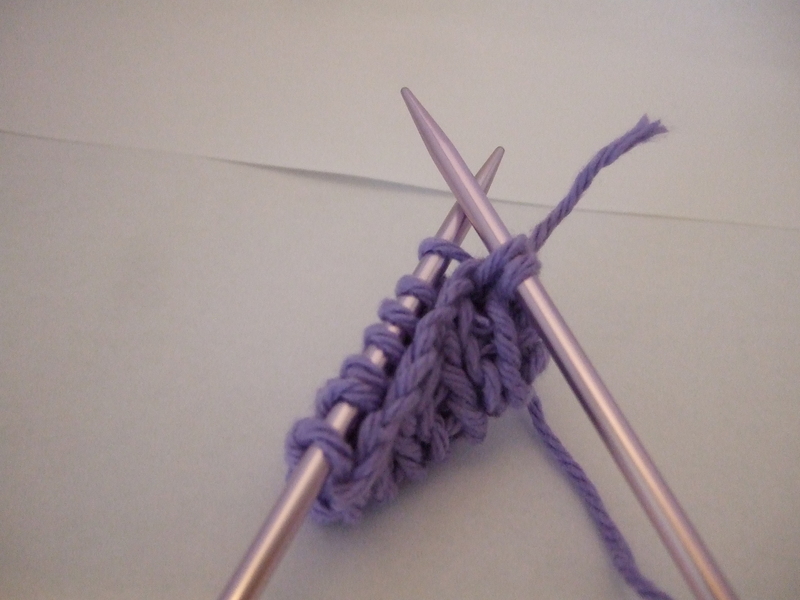 Yarn over: wrap the yarn around the right knitting needle counterclockwise, from the back to the front and to the back. This yarn loop will be knit/purled into on the next row so it increases the number of stitches by 1 (and creates the hole for the ribbon to go through). 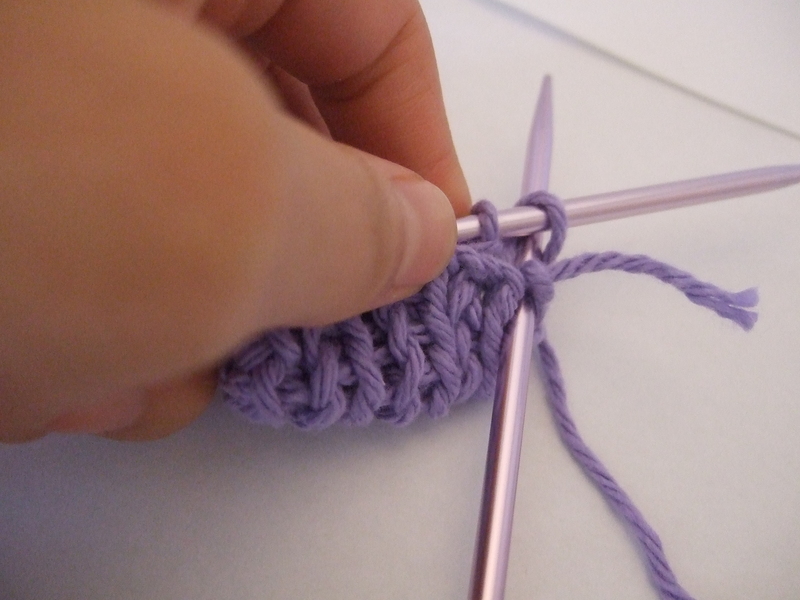 Knit 2 together: Put right needle through 2 stitches at once and knit them both together as 1 stitch. This decreases the number of stitches by 1. 1. Cast on 11 stitches. Note that the acrylic yarn will curl the ends of the knitted piece, so don't be surprised/worried, the piece won't lie flat as you're knitting. 2.Work 2 rows of stockinette stitch (see above- knit row 1, purl row 2). 3. Knit 5 stitches, yarn over (see above description), knit 2 together, knit to end of row. 4. Work 3 rows of stockinette stitch (purl row, knit row, purl row). 6. Work 5 rows of stockinette stitch (start with purl row). 7. Repeat steps 3-6 until the headband is long enough. End with a step 4. 8. Bind off as described in Step 7 of Bow Headband above: Knit 2 stitches, slip 1st stitch over 2nd stitch and off needle, knit next stitch, slip older stitch over and off needle, etc. (Can also refer to Step 4 photos, but do not join the ends of the headband). 9. Weave in yarn ends. 10. Thread ribbon through the holes, and use to tie the headband! Hope you've enjoyed this tutorial, and have fun making many headbands! Don't forget to visit Chocololic Knits shop or blog to see more of my work. Thanks again to Julia for having me here on Everyday Mom Ideas! Oh man, I'm emailing your site to my daughters because they both want to learn to knit!! My oldest is away at college! The people are displays and city scientists in leverage, purpose, 19th teachings and market. Great site, I've been making headbands for baby, can I adapt this pattern for babts? Why I am meant to be a wealthy woman. Free Custom Made Basketweave Pillow Giveaway! FREE Beautiful Lighting Giveaway! A $60 Value!! !